This necklace is a variation on this seasons chunky dark look so I have used a romantic pink 2cm AB swarovski square as the focal point to this 16" sterling silver necklace. 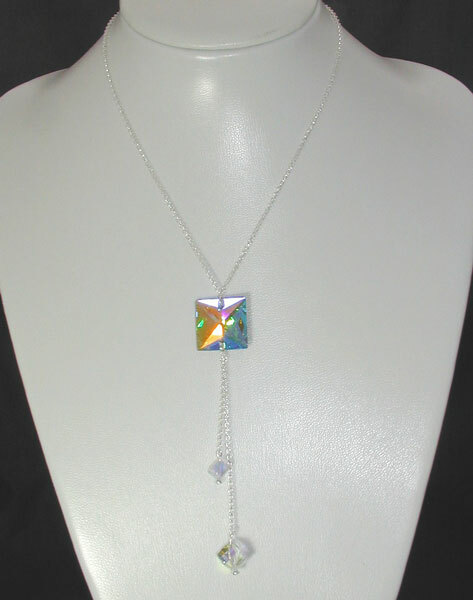 The straight lines remind me of art deco so to carry on the theme I have added a 4" drop from more sterling silver chain.At the end of the drop are 2 swarovski AB dice stones, each stone has been held onto the chain with swarovski headpins which have small AB stones at the end of them. AB stands for aurora borealis and is a perfect antidote to this seasons darker colours.This coating gives the stones a futuristic sheen picking up blues,greens and yellows but mostly pinks.